Maximum size 4 m (generally shrub). 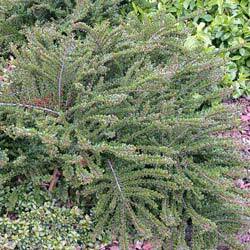 Habitat: the cotoneaster accepts any garden earth, sour or calcareous humus. It appreciates a sunny position, for a good fructification but it tolerates shade. Deciduous foliage. Elliptical, dark green leaf over, clearerly and hirsute on the underside. White to pink flowers, melliferous, in spring. Fruits: red, rounded drupes, maturing from September to the end of October. Use: decorative garden shrub because it produces a nice blossoming, and especially abundant and very decorative fruits in autumn and in winter. It is possible to plant it in hedge under the condition of pruning it to give a form and to avoid the insulated branches. Propagation: autumn cutting is quicker than seedling. Advices of maintenance: it is possible to prune it after the fall of berries. Bark: grey, shedding in strips as it matures. Deciduous foliage. Elliptical, dark green on the top, thick, grey and hirsute on the underside, apex rounded (end). White to pink flowers, melliferous corymbs, in spring. Fruits: red drupes, grouped on thick stems, from September to the end of October. Cotoneaster lacteus: dark green persistent foliage over, grey underside, height 3 m tall. Used in free hedge or pruned. Pruning for a formal shape is necessary during the 2 first years. Cotoneaster franchetii: orange deciduous foliage turning to red in autumn, persistent berries in winter, pendulous branches. Cotoneaster horizontalis: deciduous orange foliage, small leaves, red in autumn, spreading form (1 m tall on 2 metres broad). Used in low hedge. Cotoneaster salicifolius or cotoneaster with willow leaves.